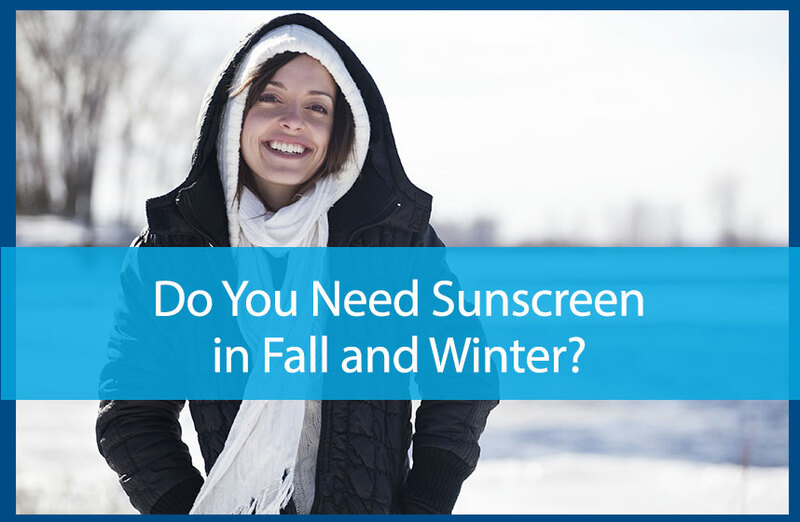 Do You Need Sunscreen in Fall and Winter? No doubt you care about your skin and your health. If you’re reading about skin care, chances are good you already apply sunscreen faithfully during the spring and summer months. However, you could be making one crucial skin health mistake – slacking off on your sunscreen routine come the fall and winter months. Unfortunately, that’s a big mistake. More than 75,000 melanoma cases are diagnosed each year, and more than 10,000 people die of the disease annually. If you want to reduce your chances of developing skin cancer, it’s time to build a sunscreen routine for life. First, let’s start with a major misconception, which is that you should only wear sunscreen when it’s hot out. However, the truth is that you should wear sunscreen when it is sunny, even if it’s cool. This erroneous belief is understandable, since hot and sunny often go together, but unfortunately this leads people to neglect their skin during the colder fall and winter months, even when the sun shines brightly. In fact, reflection from snow makes damaging UV rays brighter, so applying sunblock is even more critical on the slopes than it might be downtown on a summer’s day. Whether or not you ski or snowboard, however, you still need to put a reliable winter sunscreen routine in place. Many people also assume that they don’t need to wear sunscreen when it’s cloudy out. That’s not true either. Not only can UVA rays – considerably less easy to stop than their cousin UVB – penetrate cloud cover, they can also come through windows. That means that if you walk outside under overcast skies or sit near a window, you definitely need sunscreen. Moreover, many cloudy or rainy days end up being partly sunny, in which case you can’t afford to have neglected sunscreen. The best approach is to begin a daily sunscreen routine. That means choosing a brand you like, that doesn’t irritate your skin, and applying it every morning. For women, you can find cosmetics with sunscreen in them, but make sure they’re from a reputable brand. For men who don’t wear makeup, look for a non-greasy brand. Particularly if you will be getting a lot of sun exposure, be sure you are using a sunscreen that blocks some of the UV-A rays as well as UV-B. They are labeled “Broad Spectrum” and should greatly increase the protection from your sunscreen. Have more sunscreen questions? Avail Dermatology is a preeminent provider of dermatological services and cosmetic skin care. We’ve been in business since 1990, serving the Newman and Peachtree City communities ever since. Our board-certified physicians and friendly staff offer a broad continuum of services, including surgeries and dermatopathology analyses, as well as provides high-quality cosmetic and aesthetic services. Schedule an appointment with us today by calling 770-251- 5111.
https://availdermatology.com/wp-content/uploads/2017/01/coldsunscreen.jpg 560 858 John Lenz /wp-content/uploads/2017/08/logo.png John Lenz2017-01-27 15:48:452017-10-20 14:51:39Do You Need Sunscreen in Fall and Winter? Acne Treatments UVA vs. UVB Radiation: What’s the Difference?